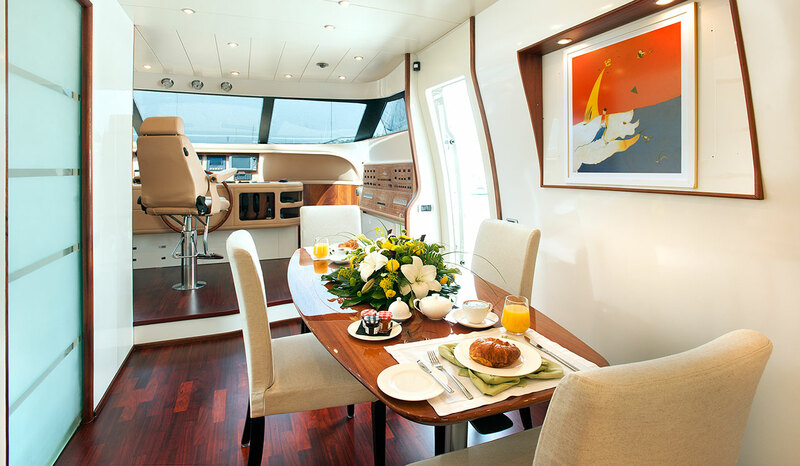 Luxury Motor Yacht CENTO is a stunning example of comfort and simplicity in cruising. 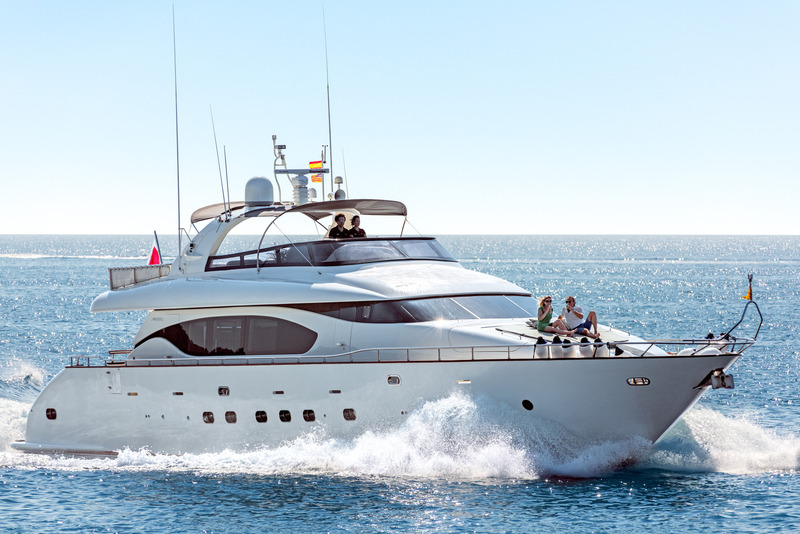 Launched in 2001 by Maiora the yacht combines a high standard of comfort and performance. 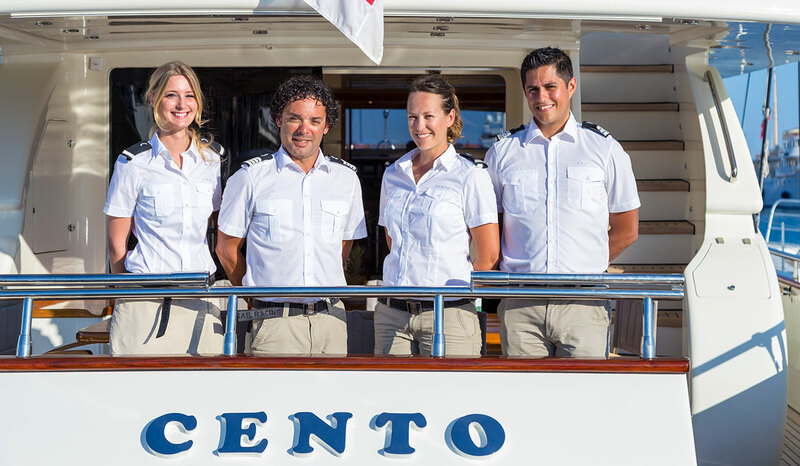 Along with a first class crew, CENTO excels in her class. She offers a tasteful elegant interior in the saloon and dining room with wood paneling, cream carpets and leather furnishings. 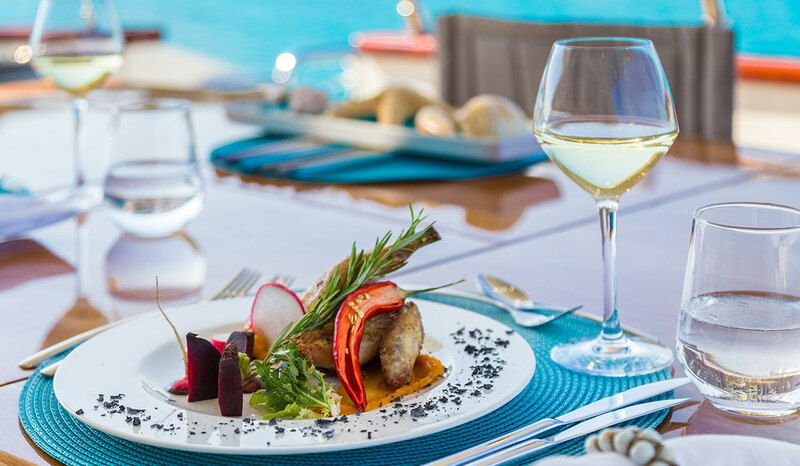 Motor Yacht CENTO is well designed with a variety of shaded and sunning areas including a second informal dining area on the aft deck and a relaxing lounge area on the flybridge. 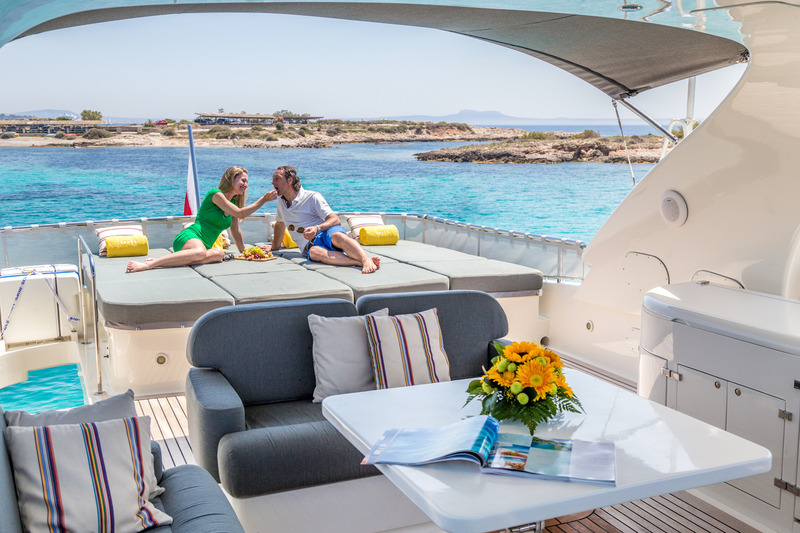 With a barbecue, an ice-maker and an enormous sunbathing area the sundeck is the ideal place to spend time relaxing, as well as for observations underway. 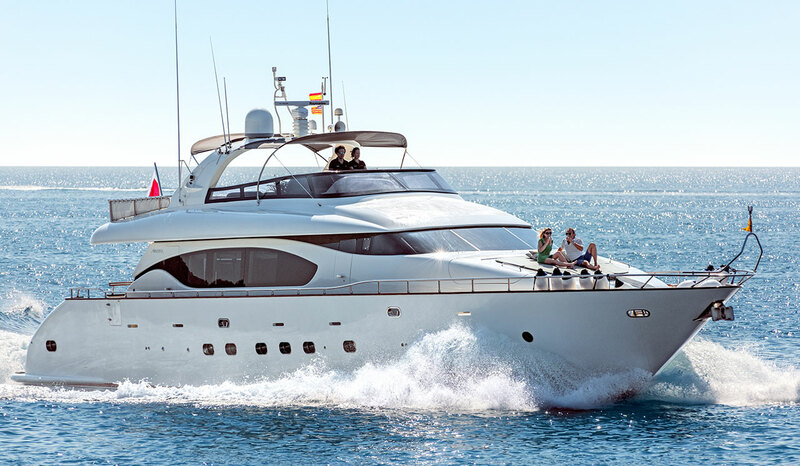 Additional features include a large garage on the foredeck, where the water toys are neatly stowed, leaving more deck space. 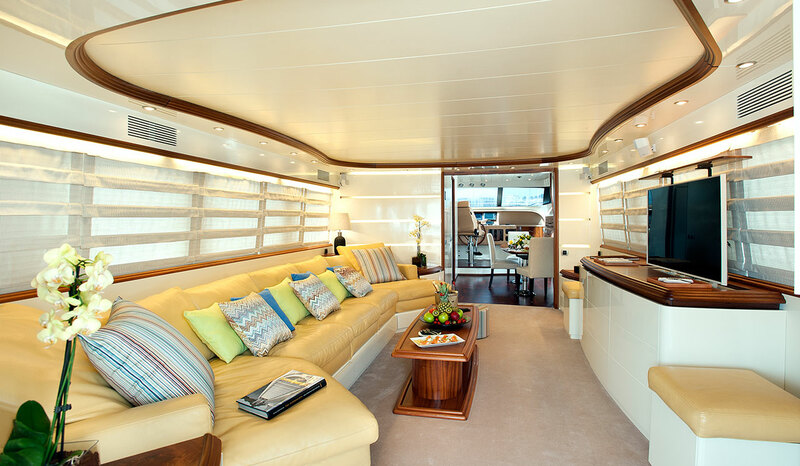 Motor Yacht CENTO has great accessibility to the water with a bathing platform, swim ladder and deck shower. 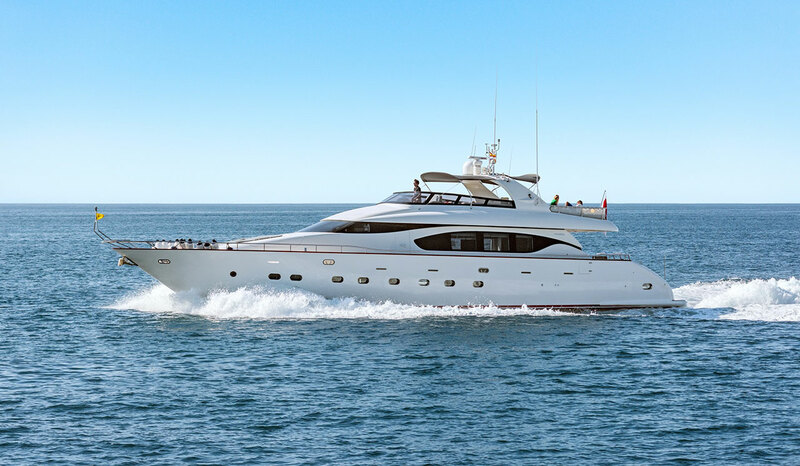 Motor Yacht CENTO is now available for charters in Palma Mallorca and the Balearic Islands. 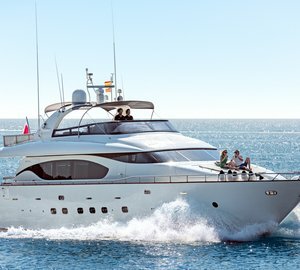 Luxury Motor Yacht CENTO is quite unique in providing three spacious double cabins. 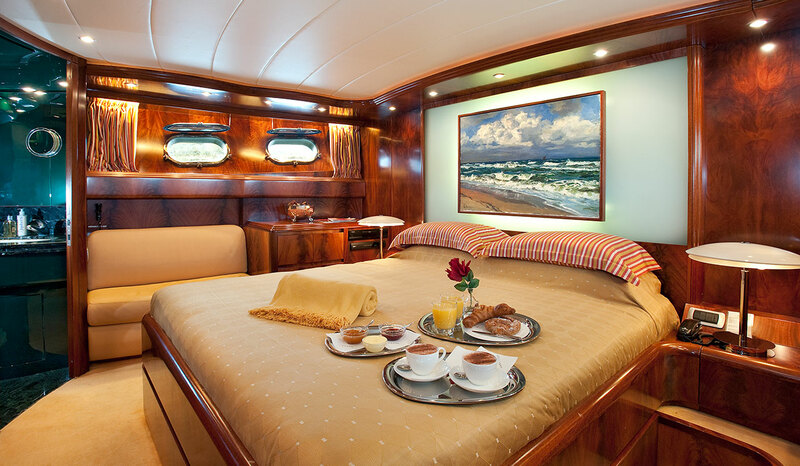 The large master cabin amidship offers a king sized double bed with a walk-in wardrobe and en-suite bathroom, fully outfitted with a Spa Pool bath. 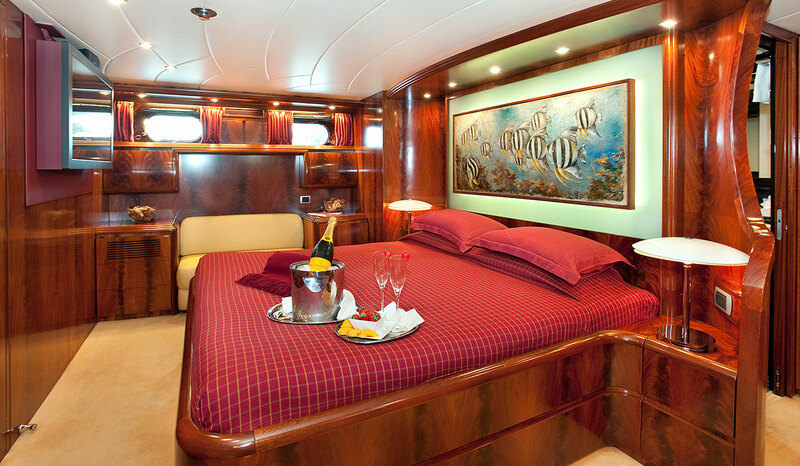 The master is equipped with TV, DVD, surround sound music system & minibar. 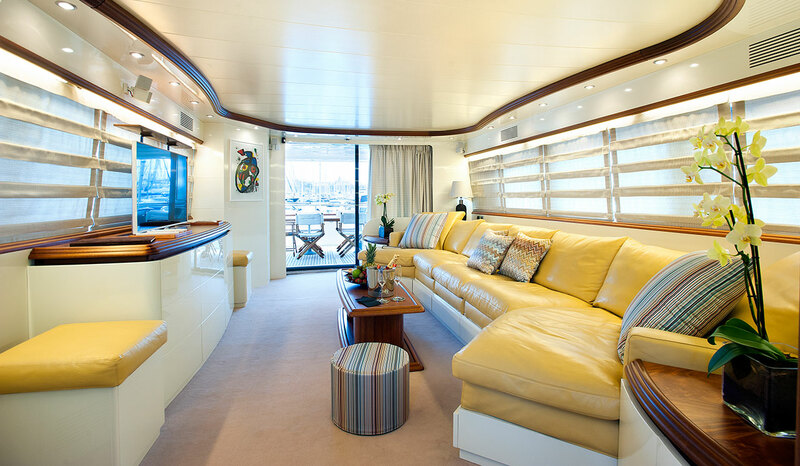 The master's cabin has an adjoining office which can also be converted into a single berth for a child. 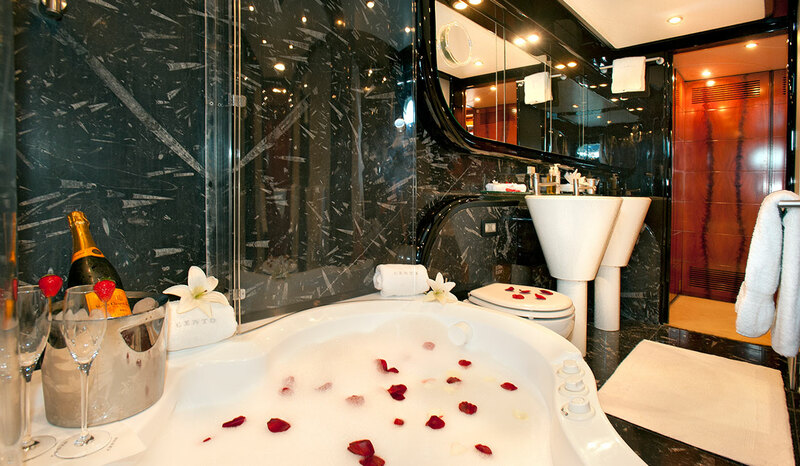 The VIP cabin is located forward with a double bed and en-suite bathroom. 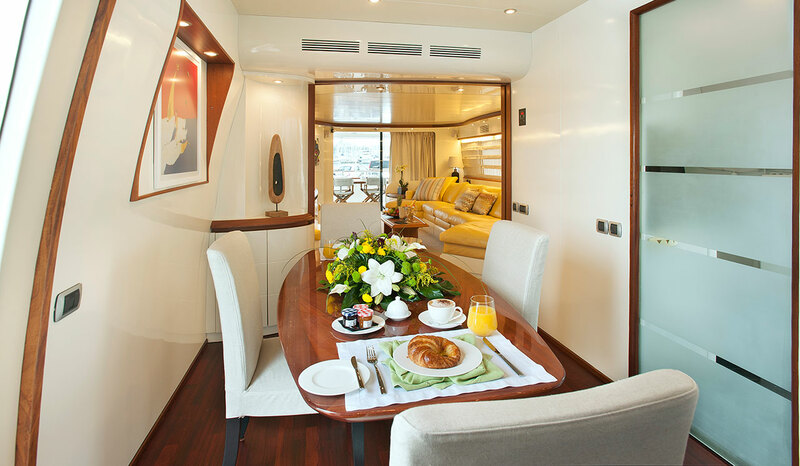 The third cabin is also a double cabin with private en-suite bathroom. 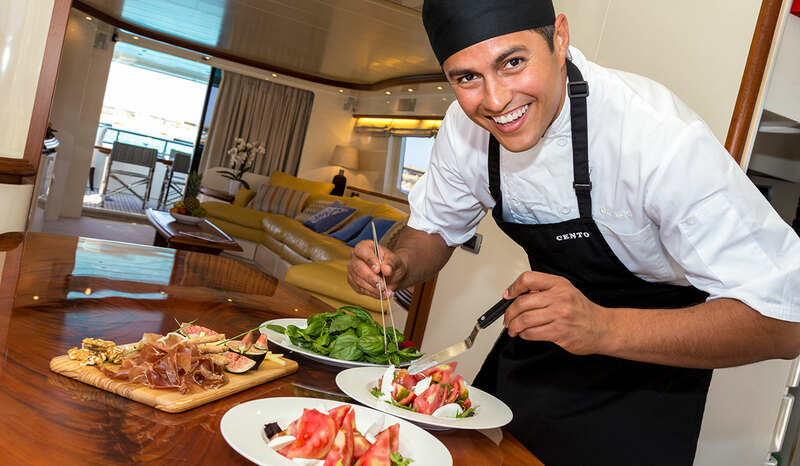 Luxury Motor Yacht CENTO is equipped with a full range of entertainment facilities to ensure a sensational vacation. Toys onboard include: Williams Tender, Turbojet 325 petrol engine with a top speed 40 knots; Sea Bob for over water under water sports diving; doughnut, Mono ski and Water-skis. Audio visual equipment includes: Sat. 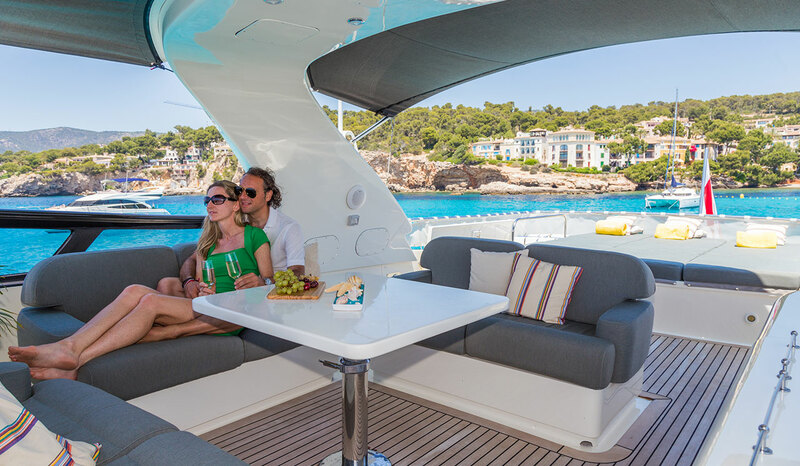 Plasma TV in saloon and all cabins, - DVD in saloon and all cabins, Radio/CD in saloon and all cabins, Video in saloon and master cabin, IPOD Docking Station, WiFi Playstation, Newspaper Direct Service, Bose entertainment system. 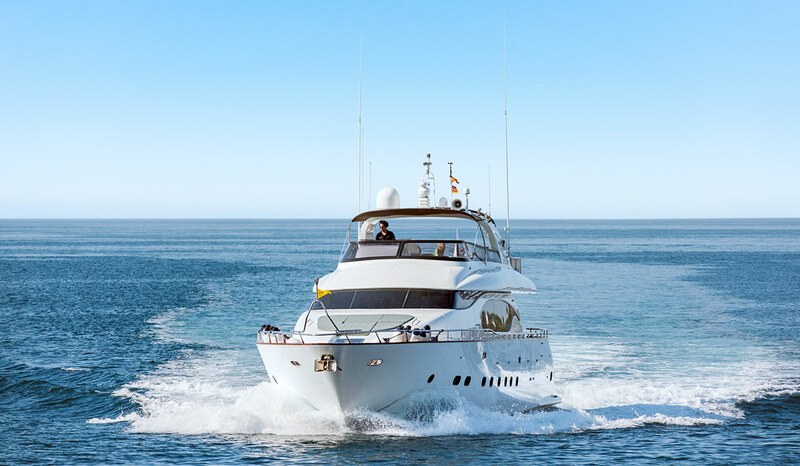 Communications include: Internal telephone system in each cabin connected to GSM phone GSM Fax SSB VHF.